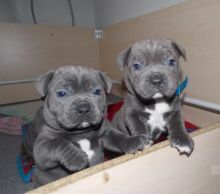 UPDATE WE ONLY HAVE TWO PUPS LEFT.cKc registered blue Staffordshire bull terrier puppies from the Valglo bloodline. We are absolutely delighted to announce our girl Shiloh has given birth to 6 healthy BLUE puppies this includes 4 males and 2 females, all the puppies are doing brilliant and our girl is a fantastic 1st time mother! Both parents are ckc registered,fully vaccinated and h-c clear! Both parents are blue with excellent temperaments great bone structure and very good examples of the breed! All the puppies will come ckc registered with no endorsements, have their first vaccination, microchipped and be wormed until they are ready to leave for there forever homes! We will provide any further support that’s needed!.We have just a male and a female left and they are both 11 weeks old now.